I know these usually come from the husband, but I have a couple of my own to share after our goose moving weekend. As you have probably seen in some pictures, I’ve been wearing these rain boots around the farm all spring and summer. They were waterproof and cute. They were also easy on/off because I just hopped in and could go, which is important to me as I’m part hillbilly and would prefer to be barefoot. However, they are also falling apart. Most of the rubber has broken off so I’m mostly wearing an insert with some rubber around it while outside. It was fine until it started getting cold and then when I’d get splashed or step in a puddle, would take me forever to get warmed up. When Hubby was home in October, I told him I needed good farm boots. 😉 Off to Big R (the farm supply store) we go. 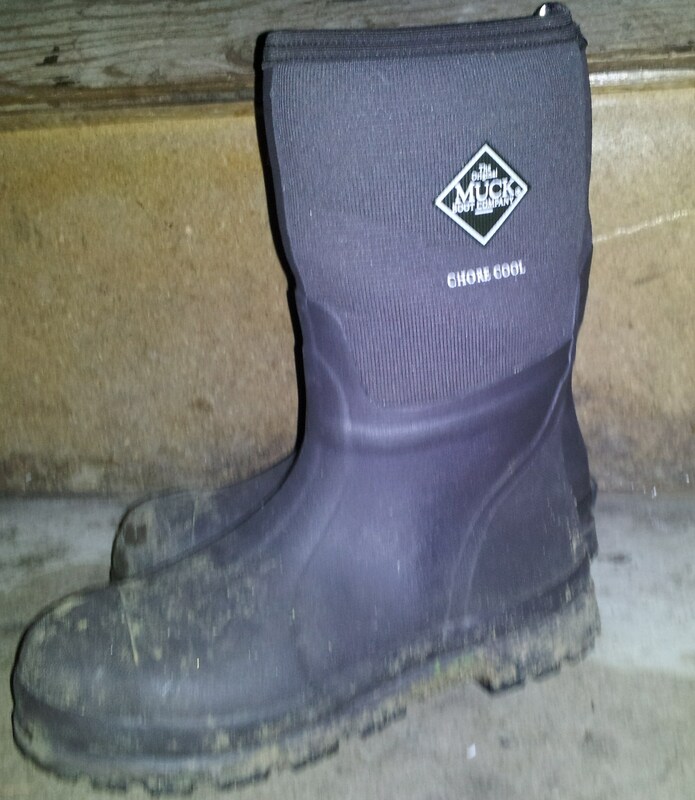 I found some called Chore Cool Mid All Condition Work Boot by The Original Muck Boot Company. I didn’t want to get them dirty too soon so I waited a couple of weeks before venturing out with them, and wished I hadn’t. These boots are AMAZING! Waterproof-truly! I have never believed that claim because I’ve never had a good pair of shoes that could hold up to it. I didn’t realize I’d gotten water on my pants until I took the boots off. Lightweight! My knees and ankles don’t ache at the end of the day from lugging around heavy soled boots. Clean easily if they are dirty. Hose them off-they are waterproof! I love it! Easy off and on. No strings to come undone and drag through muck and water. Xpress Cool-my feet can actually breathe in these, even with my heavy duty socks on. If it gets too cold, I can double up the socks, or use the toe warmer packs if I’m going to be out long. Same trip, I asked for gloves. I grabbed a pair of Women’s Waterproof gloves by Serius Xtreme. I thought they were spendy ($30) but they had the best fit and are neoprene material. There aren’t many gloves where you don’t have a lot of fingertip fabric, or not enough to be comfortable while working, but these truly are just the perfect work glove. I will probably beg for another pair or two as I know as rough as I have been on them, I will need another. Again, the fingertips are perfect. Most gloves (unless mechanics gloves) have just too much room at the fingertips, and I am always pinching it between wood or whatever project I’m working on outside. Haven’t done that in these yet. I’m rough on gloves. These have a non-skid type lining on the outside that has held up to my abuse (and a few nips by a piglet or two). I think these are both fantastic products to have, even if you don’t spend 9 hours a day outside. I just need to stay dry and warm while feeding, and watering, and they’ve held up for that, and much more. If you are in the market, I suggest giving these a try if you can find them. It is now December 31st and the boots have still held up amazingly. I love them. The gloves…well, it was great when the low temperature was in the 40’s back in November. Now, they do not keep my hands toasty warm (the temp is getting down in the teens), but I am only side 15-30 minutes each time I need to feed/water so it’s bearable. For projects longer than that amount of time, I will need new gloves. P.S. The dog ate one of the gloves, so I need a new pair anyway. This entry was posted in Tools and Equipment, Uncategorized by Charity. Bookmark the permalink.